New York finally got its own outdoor nighttime market with the much-anticipated debut of the Queens International Night Market at Corona Park in late April. Now, after staging six successful markets packed with all kinds of international street foods like takoyaki, Korean fried chicken, empanadas, Peruvian steak sandwiches, Colombian hot dogs (and tons more) and over 30,000 total visitors, organizers are looking to raise some money so they can keep the eclectic Saturday night feeding frenzies open in July. 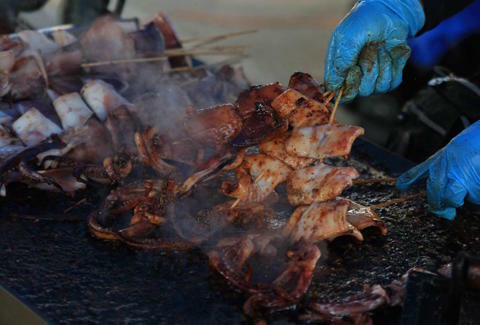 While the market takes June off, founder John Wang has launched a Kickstarter campaign to raise the $50,000 needed to reopen the glorious nighttime chow fests for nine or 10 more Saturdays this year, starting July 4th. Previous markets -- held on Saturdays from 6pm to midnight -- have included as many as 80 vendors, including food, art, and other goods, but Wang hopes the market will return bigger and more delicious than ever with over 100 vendors. The funding will not only allow the market to pay its bills ($12,000 per night), but also maintain its low $5-or-less prices at 90% of the food vendors, according to the campaign page. Everyone will win. So, if you're into spending beautiful summer nights stuffing your face with things like fried ice cream, fried noodles, mini Dutch pancakes, Spam musubi, pig parts on a stick, traditional Trinidadian shark sandwiches, crawfish boils, and tons of other stuff, then you might want to consider a pledge -- and plans for its glorious return. Tony Merevick is Cities News Editor at Thrillist and is just drooling all over his keyboard thinking about all of this food. Send news tips to news@thrillist.com and follow him on Twitter @tonymerevick.